D4 starts off rather grounded. The game's opening narration describes the tale as a "story of a man with a very strange fate." 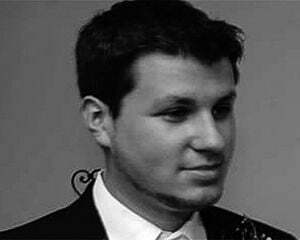 A man whose wife was murdered, and is tirelessly searching for her killer. Then a cat girl named Amanda runs into your apartment, spits a mouse into your mouth, and you puke. David Young is the hero of D4, and the mystery of his murdered wife is the focal point. Her last words linger in his mind since that moment -- "Look for D." Is D a location? A person? David's obsession with the event drives him off the police force and onto his own investigation. Oh, and one small note -- a bullet that went through his head as a result of that night granted him the power to go back to the past using items called "momentos," through a process called "diving." Yep, this isn't your typical noir thriller -- this is by Swery65, the famed developer best known for directing Deadly Premonition. It's an adventure game, and fans of the genre will immediately pick up the simplistic control scheme. There's a cursor on screen, which can be used to investigate or interact with the environment. D4 supports Kinect gestures, but I felt completely comfortable using a controller the entire time (the analog stick controls the cursor like a mouse), and didn't feel like I was missing anything. In addition to the aforementioned cursor controls you can also "push" or "grab" objects, which is done by using the appropriate gesture, or more simply, the A and X buttons respectively. That's basically all you need outside of the contextual QTE scenes or minigames. You'll have the chance to move from one fixed area to the next, investigate locations, hunt for objects, and look around with a fixed camera angle. It's part visual novel and part adventure, as "hidden objects" are abound, as well as optional collectibles and tons of items. There's also a strategic element of sorts with investigating objects, as David has a stamina and health meter. Using most actions will expend stamina, and pain of any kind will incur a health loss, which can be regained by finding food and medicine in the wild. Losing all your health will require you to restart from a previous point, and you can save your progress by way of using telephones in the environment. You'll also have an Assassin's Creed eagle eye-like "Vision" mechanic at your employ, which highlights objects that can be interacted with in gold -- to refill that meter you'll have to drink something. What I really like about D4 is that it draws you into its world immediately. From the moment that Amanda busts through the door and is introduced as a "freeloader/grocery shopper" that actually lives with you, to the first time you start walking through David's house, I felt like the world I was given wasn't just a fleeting creation -- like it had existed long before I was introduced to it. You basically see the story unfold through David's eyes, and hear his inner thoughts the whole time -- including some depressing "are they or aren't they real" hallucinations of his wife, Peggy. His mind isn't stable, and it creates an interesting storytelling dynamic as both you as the viewer and David himself try to make sense of things together. Gameplay is also more interactive than your average adventure game. You need to actually pay attention when watching cutscenes, as a button prompt may occur that could provide you with additional information on an object or person. My favorite part is how the game handles highlighting random objects in the game world. By simply putting the cursor over something as mundane as a toilet, small phrases will pop up on the screen to give us the full story on something -- like the fact that said toilet is "no longer used" and has a "rusty lever." This is a much more interesting method of handling the formula than, say, Telltale does it. Highlighting a cabinet in David's home might tell you that it was his wife's favorite spot to store things, and that she used to keep it tidy. Highlighting a microwave will give you even more facts, one of which is that David uses it daily -- likely to allot more time to the investigation. It's little things like this that let you piece together the game's universe at your own pace. Everything in D4 also feels incredibly organic. Turning on the TV will play the cartoon "Sebastian the Sleuth," an original creation that involves a crime solving cat. Amanda will sometimes randomly leave the house through a window, and return later. Even looking at objects you can't interact with, like a wall full of pictures of David and Peggy will give you a glimpse into how deep their relationship was, and some of the major milestones in their lives. 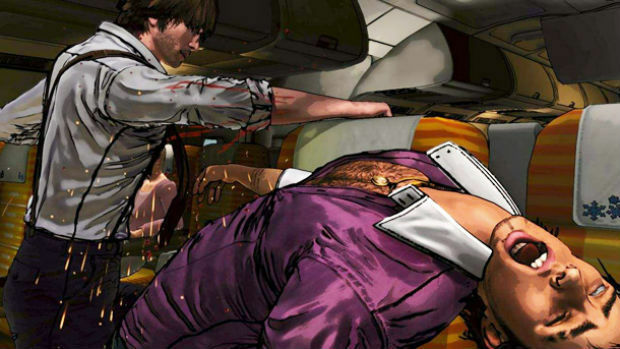 D4 also employs a comic book-like effect in some of its cutscenes, splitting the screen to show multiple reactions, characters, or environments. It helps keep things interesting, and the pulp feel on top of the noir and wacky elements all mesh together quite well. Another home-run hit in terms of atmosphere is the soundtrack. While most of its songs are generally soothing and fit the detective theme, the piano tunes are beautiful as standout tracks, and there's a diverse array of genres present -- even Irish Rock during intense scenes. D4 is set up as an episodic game, with the initial package (reviewed here) offering a prologue episode, as well as Episodes 1 and 2 -- the rest will come later. The prologue takes place wholly in David's home and takes roughly 30 minutes to complete, but there's a surprising amount of things to play with and find. Episodes 1 and 2 take roughly an hour each if you're just going for the story, but again, both have tons of extras, as well as optional minigames and missions. For example, one sidequest involves calming down a paranoid passenger, and another tasks you with answering quizzes with various aircraft-related questions. Despite how short some of these quests are, it's insane how much detail was put into just about every facet of the game. You can find magazines related to sports, the government, and topics such as the Verizon Center and the Lumière brothers just lying about in the game's world, which provide brief and interesting real-world facts. There are also badges to find, which grant you credits that you can use to buy food, stamina, or vision points, as well as extra outfits for David and his companions. 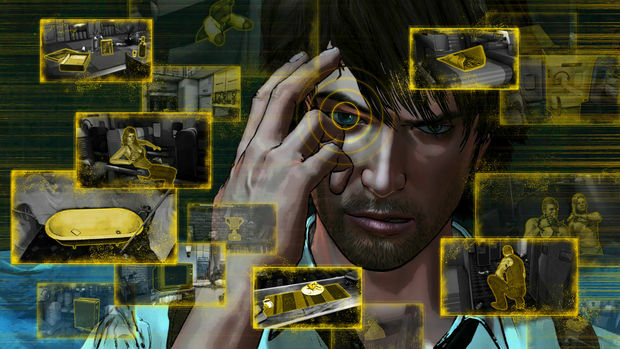 Very rarely am I tempted to replay an adventure game right after I completed it, but that's what I did with D4. Oh, and there's also full leaderboard support. 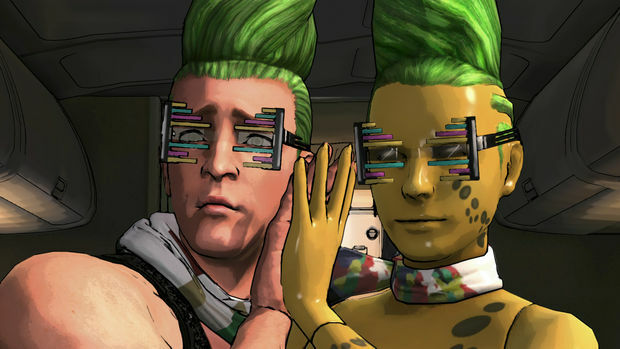 It ends on a cliffhanger, but D4 has me intrigued, mostly because I felt a genuine attachment to the characters. I want to see this journey through to the end, and the classic Swery wackiness kept me interested throughout the relatively familiar adventure genre gameplay.